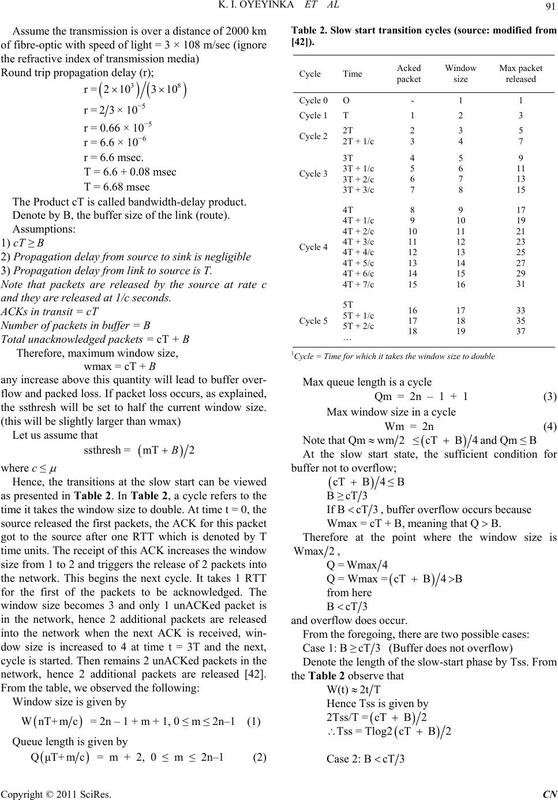 based congestion control algorithms that use the size of congestion window to determine transmission speed. The two main algorithm of window based congestion control are the congestion avoidance and the slow start. proposed. 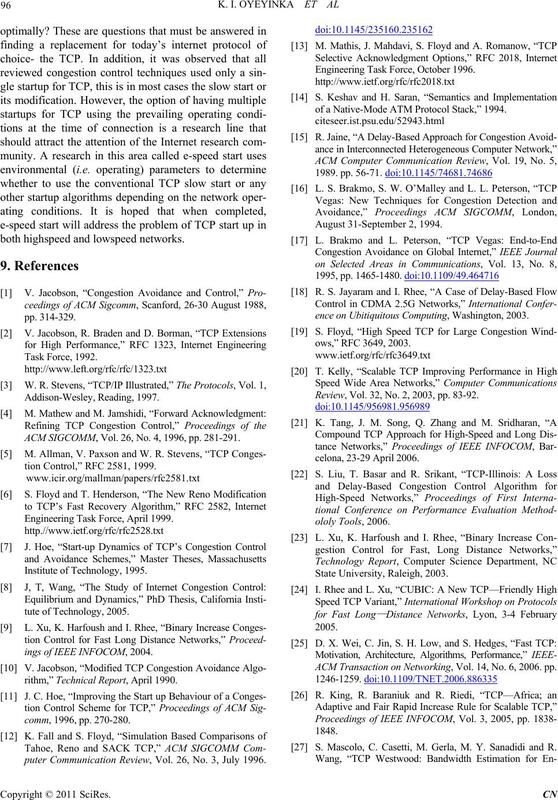 Multiple startups for TCP specify that startup speed is selectable from an n-arry set of algorithms. liver data not necessarily guaranteeing the delivery. sulted in congestion collapse throughout the mid 80s. ously by several researchers among these were [2-7]. start stage and acknowledgement congestion control. while section 8 concludes the paper. its algorithm to include the fast retransmit mechanism. until a timeout occurs. This is discussed in detail in [3,5]. all the outstanding ACKS for that window. solve two problems of TCP Reno and New Reno i.e. more than one lost packet per RTT. Reno. It also has the coarse grained time out of Tahoe. acknowledged and which ones are still outstanding. when to send a packet from which packet to send. resend them when it is able. was entered have been received. remented by two rather than one. and is presented by [16,17] as TCP Vegas. could not receive enough duplicate ACKs. increases, the window size also increases. tion control, it is necessary to measure propagation delay. commercial CDMA (Code Division Multiple Access). traffic today. It became officially recognized in 2004 . Table 1. 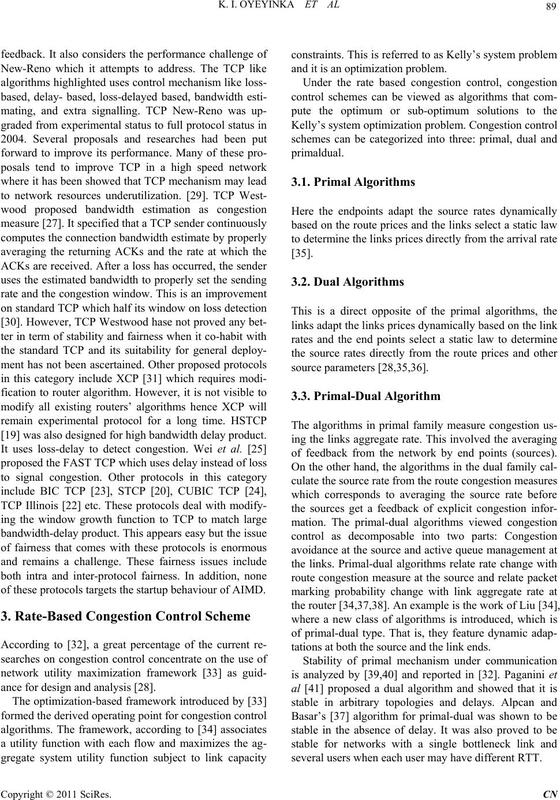 Variants of TCP congestion control implementation (using TCP new reno as basis). West wood +  Bandwidth estimation Higher throughput over wireless networks. High capacity & large delay networks. was also designed for high bandwidth delay product. of these protocols targets the startup behaviour of AIMD. ance for design and analysis . and it is an optimization problem. of feedback from the network by end points (sources). tations at both the source and the link ends. several users when each user may have different RTT. replace the Jacobson algorithm . share a bottleneck link with other traffics on the Internet. system state evolves as a series of discrete events. averages of the true system state. two phases: slow start and congestion avoidance phase. size, then transit to slow start phase. following example be considered as presented in . The Product cT is called bandwidth-delay product. Denote by B, the buffer size of the link (route). 3) Propagation delay from link to source is T.
and they are released at 1/c seconds. the ssthresh will be set to half the current window size. network, hence 2 additional packets are released . Wmax = cT + B, meaning that Q  B.
congestion window size using the estimated bandwidth. of delayed or lost ACKs and RTO timeouts. which can be costly and problematic. and uses it to tune TCP to deliver higher transfer speed. Capacity estimation is done using two network scenarios. work thereby not suitable for future gigabit networks. supplied feedback that can benefit from this scheme. 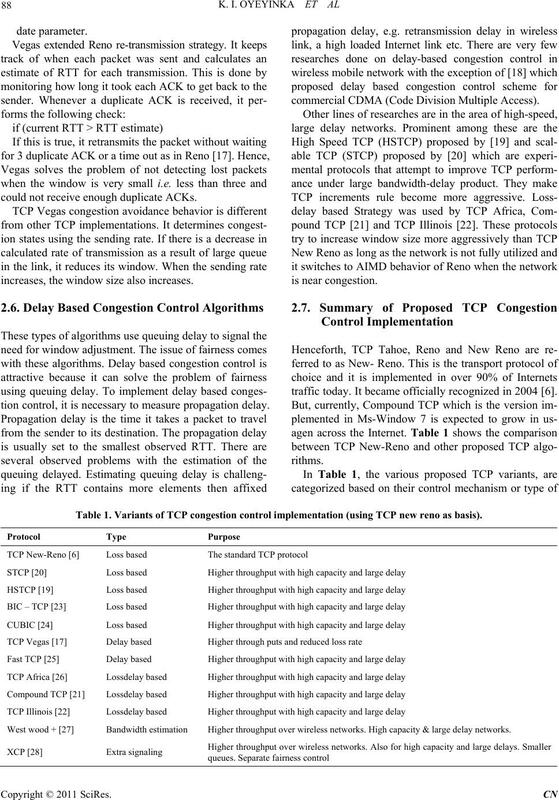 issue of choosing the initial congestion window for TCP. the sender transmits at the normal TCP startup speed . the current Internet as well as the future Internet. mitted for a very long time in networks with large delay. lems are solved with the introduction of TCP New-Reno. ability to detect any other packet-loss in the window. detecting each packet loss i.e. it takes more one RTT. Retransmission of more than one lost packet per RTT. edgement which is a bit cumbersome to implement. Table 3. Modifications of slow start. TCP Vegas  Parameter based Double cwnd every other RTT. Limited slow start  Parameter based Eliminates the exponential growth of cwnd. SPAND ( Bandwidth Estimation Obtain network state to determine initial sending rate. edgement spacing for estimating appropriate cwnd. width to adaptively and repeatedly reset ssthresh and cwnd. 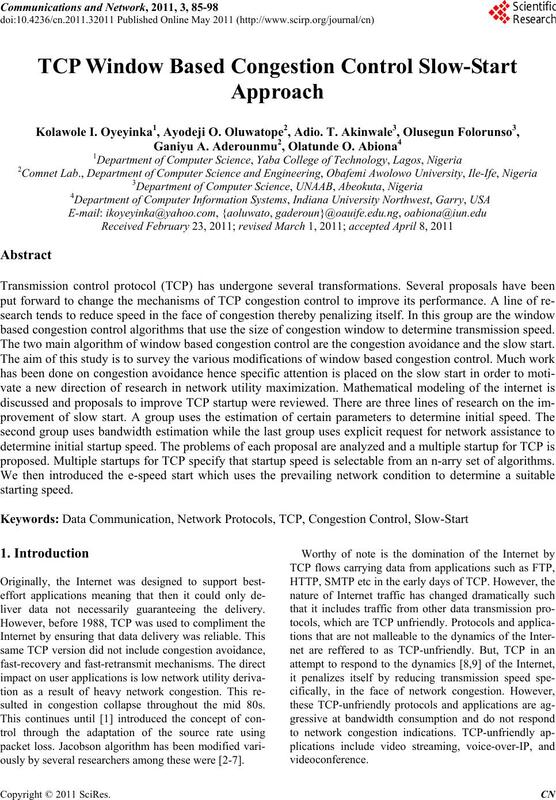 Capstart  Bandwidth Estimation Estimate path capacity and tune TCP to deliver at higher transfer speed. 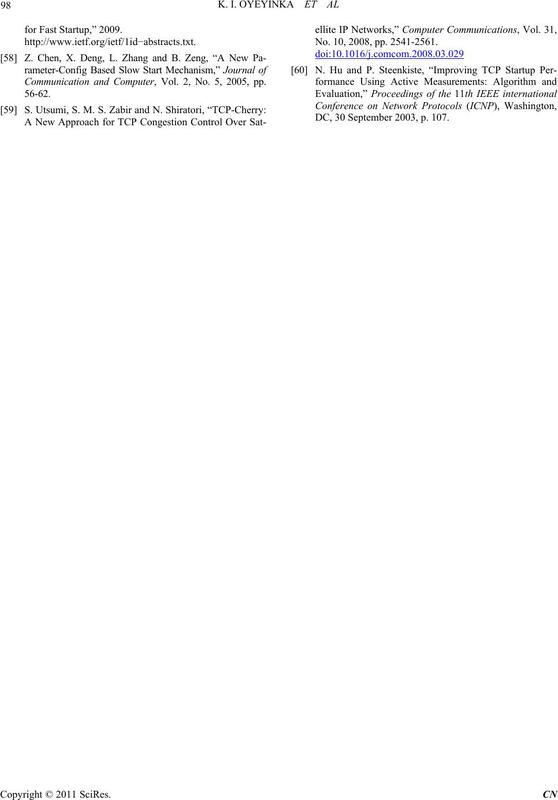 Congestion Manager  Require network assistanceCollects congestion status information and share with endpoints. Table 4. 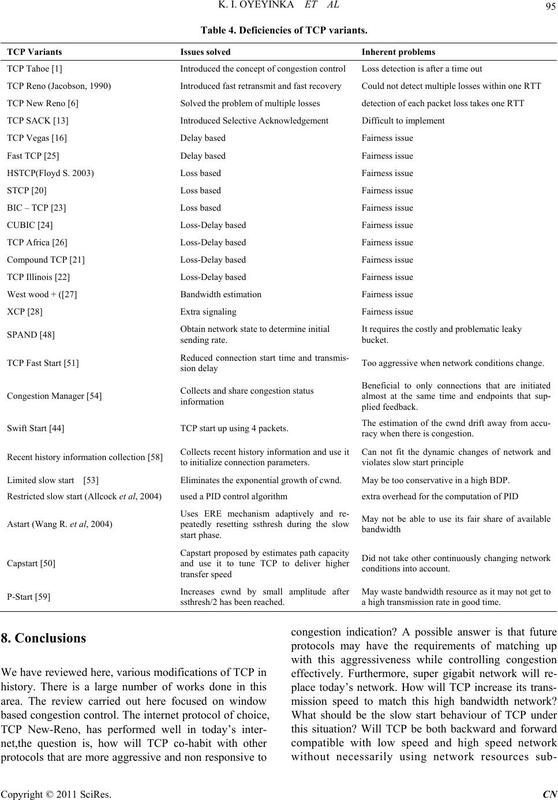 Deficiencies of TCP variants. sion delay Too aggressive when network conditions change. racy when there is congestion. Limited slow start  Eliminates the exponential growth of cwnd. May be too conservative in a high BDP. a high transmission rate in good time. mission speed to match this high bandwidth network? both highspeed and lowspeed networks. 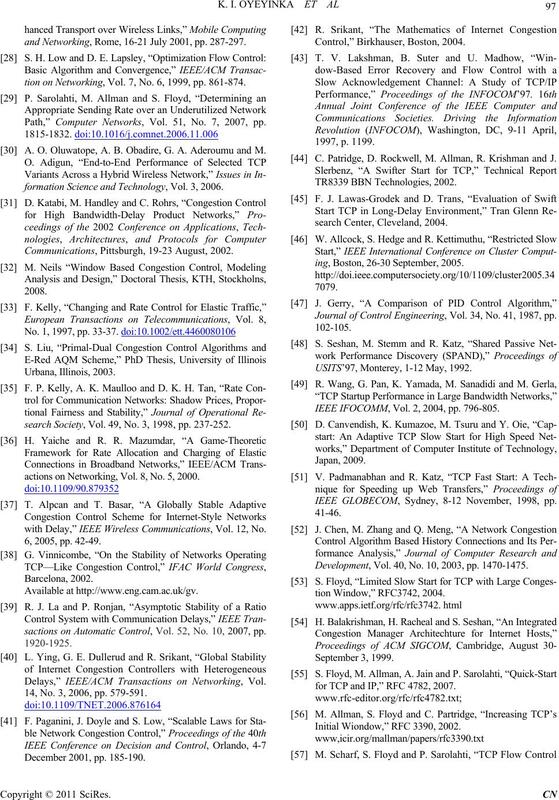 ACM SIGCOMM, Vol. 26, No. 4, 1996, pp. 281-291.
tion Control,” RFC 2581, 1999. 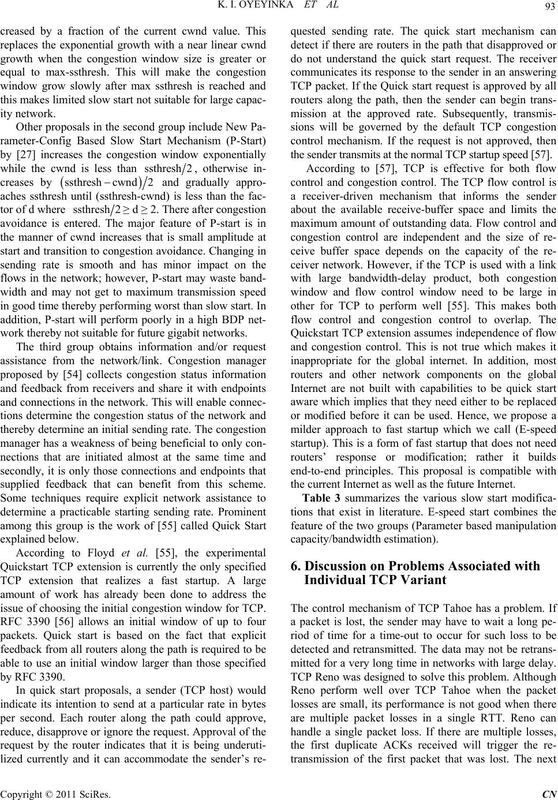 Engineering Task Force, April 1999.
ings of IEEE INFOCOM, 2004.
rithm,” Technical Report, April 1990.
puter Communication Review, Vol. 26, No. 3, July 1996. Engineering Task Force, October 1996.
of a Native-Mode ATM Protocol Stack,” 1994.
ence on Ubitiquitous Computing, Washington, 2003.
Review, Vol. 32, No. 2, 2003, pp. 83-92. 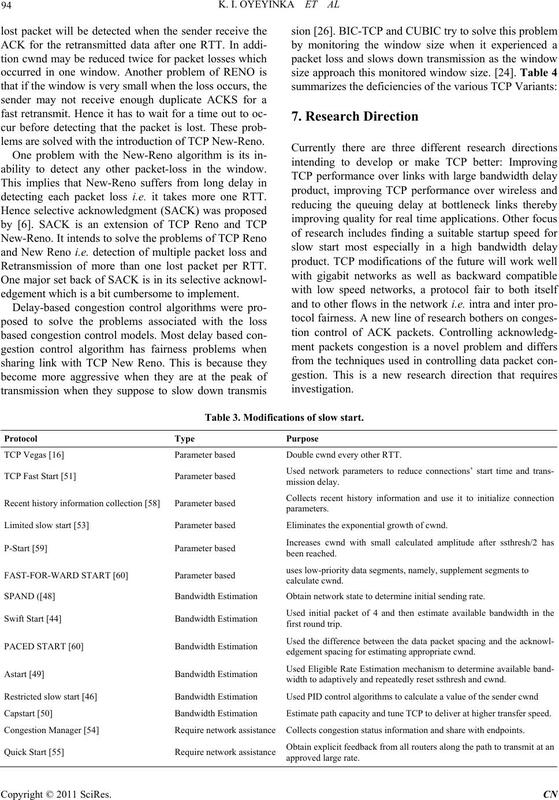 ACM Transaction on Networking, Vol. 14, No. 6, 2006. pp. S. Mascolo, C. Casetti, M. Gerla, M. Y. Sanadidi and R.
and Networking, Rome, 16-21 July 2001, pp. 287-297.
tion on Networking, Vol. 7, No. 6, 1999, pp. 861-874. Path,” Computer Networks, Vol. 51, No. 7, 2007, pp. A. O. Oluwatope, A. B. Obadire, G. A. Aderoumu and M.
formation Science and Technology, Vol. 3, 2006. Communications, Pittsburgh, 19-23 August, 2002.
search Society, Vol. 49, No. 3, 1998, pp. 237-252.
actions on Networking, Vol. 8, No. 5, 2000.
with Delay,” IEEE Wireless Communications, Vol. 12, No. sactions on Automatic Control, Vol. 52, No. 10, 2007, pp. 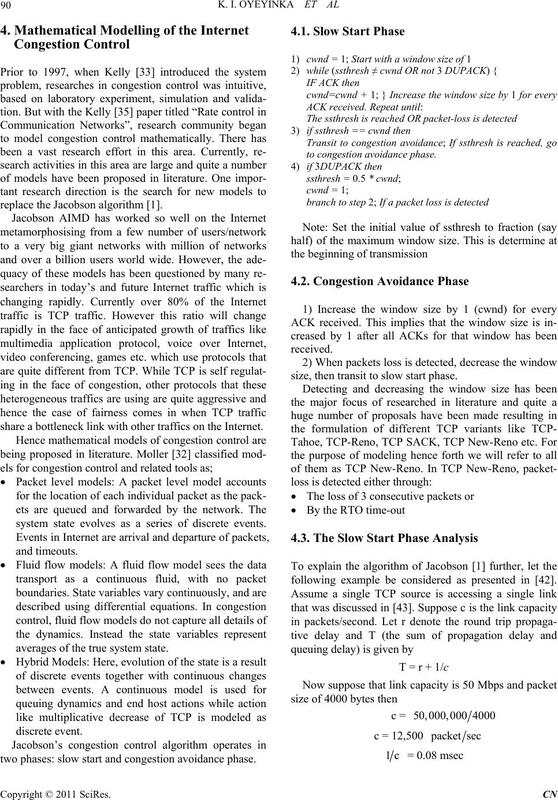 Delays,” IEEE/ACM Transactions on Networking, Vol. 14, No. 3, 2006, pp. 579-591. C. Patridge, D. Rockwell, M. Allman, R. Krishman and J.
ing, Boston, 26-30 September, 2005. 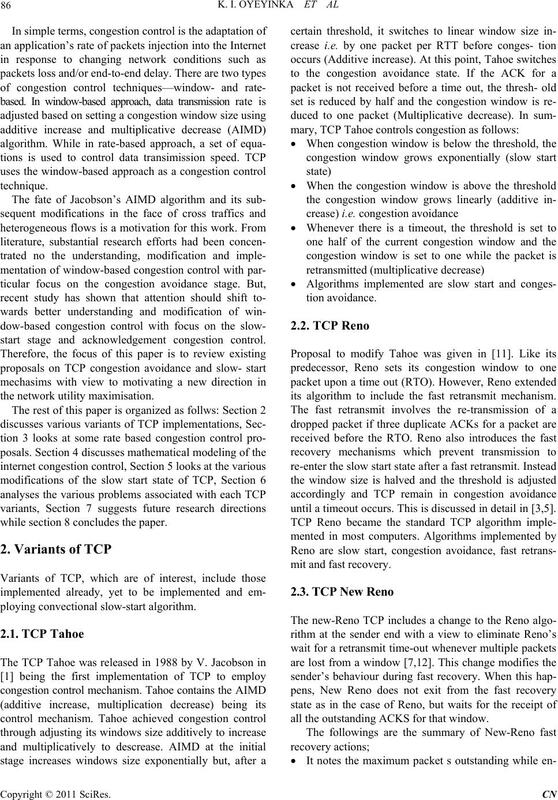 Journal of Control Engineering, Vol. 34, No. 41, 1987, pp. USITS’97, Monterey, 1-12 May, 1992. IEEE IFOCOMM, Vol. 2, 2004, pp. 796-805. IEEE GLOBECOM, Sydney, 8-12 November, 1998, pp. Development, Vol. 40, No. 10, 2003, pp. 1470-1475.
for TCP and IP,” RFC 4782, 2007. Initial Wiondow,” RFC 3390, 2002. Communication and Computer, Vol. 2, No. 5, 2005, pp. No. 10, 2008, pp. 2541-2561. DC, 30 September 2003, p. 107.